Simian Skill have formed a partnership with Tough Scaff in order to open a Construction Industry Scaffolders Record Scheme (CISRS) Overseas Scaffolder Training Scheme (OSTS) centre in Chennai, Southern India. The Centre will offer CISRS Level 1 Scaffolder Training, Basic SITS (Scaffold Inspection Training Scheme) and Scaffolding Supervisor Training with the scope to gain accreditation for Level 2 and 3 as demand increases. The centre hit the ground running with the first ever CISRS OSTS Level 1 scaffolder course taking place, the same week accreditation was awarded. Seven Trainee scaffolders attended the course, five of which were employed by Cape PLC. 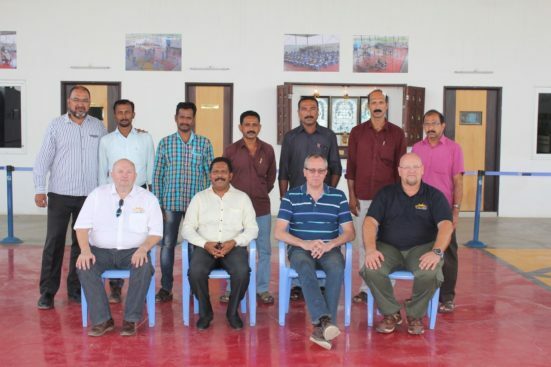 A delegation from Cape’s operation in the Middle East were also coming to Chennai to see their employees being put through their paces, by CISRS OSTS Instructor Craig Dixon. There are a huge number of Indian nationals currently working as scaffolders in the Middle East region. The centre provides on-site accommodation, welfare facilities and food for delegates which means they can travel from all around the region to carry out training at the centre. To find out more about the new CISRS OSTS scheme, CPD courses, obtain a copy of the CISRS CAP 609 General Information Booklet, new cards poster or to find out more about CISRS, please visit www.cisrs.org.uk or email enquiries@cisrs.org.uk.